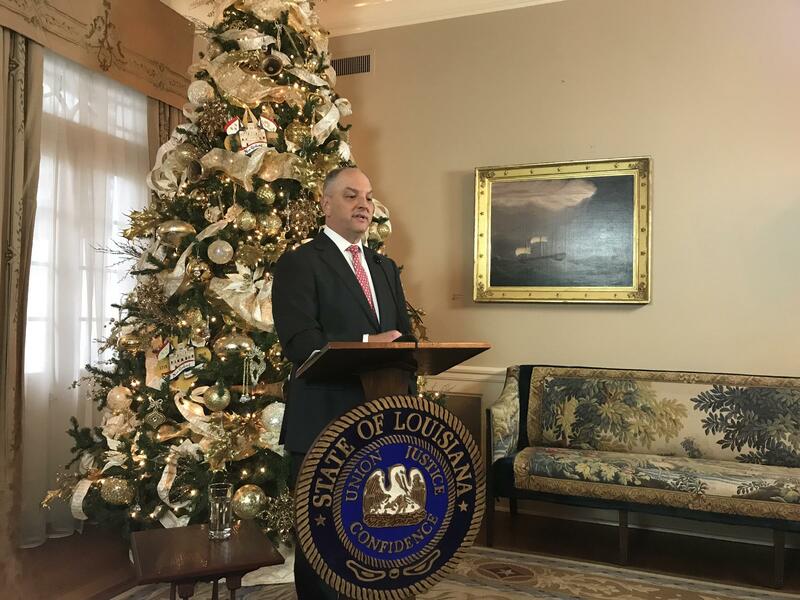 Governor John Bel Edwards gave his end-of-the-year press conference on Thursday, December 20, 2018 at the Governor's Mansion in Baton Rouge. As 2018 draws to a close, Governor John Bel Edwards says he’s pleased with the progress that’s been made, and he remains optimistic about the future of Louisiana. The Governor listed a number of economic accomplishments at his end-of-the-year press conference Thursday. Louisiana’s unemployment rate is the lowest in a decade. The state has replaced a $2 billion budget deficit with a $300 million surplus. After three special sessions, the Legislature avoided a budget deficit of more than $500 million by setting the state sales tax rate at 4.45% for seven years; the move got the state off negative watchlists for credit rating agencies. And after nearly a decade of budget cuts, higher education funding, says the Governor, has been stabilized. “The size of our economy is bigger now than it has ever been,” Edwards noted. Those accomplishments were buffered, however, by a U.S. Bureau of Economic Analysis report released earlier in the day. According to the report, Louisiana’s personal income growth slowed to a rate of 2.3% in the third quarter of the year, one of the lowest rates in the nation. Governor Edwards says tariffs at the federal level are to blame. In the first half of 2018, Louisiana had some of the highest personal income growth in the nation. Wage growth in the first quarter came in at 6.6% and 4.8% in the second quarter. At 2.3%, Louisiana’s third quarter personal income growth rate is less than half of what it was earlier this year, lagging behind the US average of 4%. Farm earnings took the biggest hit. Governor Edwards says tariffs and the tense trade relationship between China and the US are a big factor, and are hurting Louisiana farmers - especially those who grow soybeans. Edwards sent a letter to President Trump in July describing how these tariffs dampen Louisiana’s ports, petrochemical and agricultural industries. He’s asked the President to reconsider the policy, and encouraged Louisiana’s congressional delegation to raise the issue. Governor Edwards says he believes it’s unlikely that the US 5th Circuit Court of Appeals in New Orleans or the United States Supreme Court would uphold a decision by a federal judge in Texas who ruled the Affordable Care Act unconstitutional late last week. “I’m not going to tell you I’ve lost any sleep over it,” said the Governor. The decision came in response to a lawsuit brought by elected Republican leaders from 20 states, including Louisiana. The challenge to the healthcare law -- commonly known as Obamacare -- was led by Texas Attorney General Ken Paxton, on the grounds that the section of the ACA requiring people to have health insurance is unconstitutional. United States District Judge Reed O'Connor agreed. Louisiana Attorney General Jeff Landry signed on to the lawsuit in February, calling the ACA federal overreach. Edwards, who criticized Attorney General Landry’s support of the lawsuit, has tasked Representative Chad Brown (D-Plaquemine) with carrying a bill in the 2019 session that would reflect many of the key provisions in the Affordable Care Act. At the top of the Governor’s legislative priorities in the 2019 session is a pay raise for Louisiana teachers. Edwards is suggesting a yearly wage increase of $1,000 for teachers and $500 for school support personnel, like bus drivers. “If you talk to Republicans and Democrats in the House and Senate, there is near universal support for the pay raise,” he said. The Governor remains confident he’ll be able to get the job done. He intends to fund the pay raise - which is expected to cost the state $135 million in the first year - with increased state revenue. State economists estimate Louisiana’s income will be about $125 million higher than expected this fiscal year. But Speaker of the House Taylor Barras (R-New Iberia) blocked that updated figure from being adopted at a December meeting of the Revenue Estimating Conference, throwing a wrench in the Governor’s teacher pay raise plan. Unless that money is recognized, he’ll have to find funds from elsewhere in the budget to increase teachers’ wages. After nearly three years in office, Governor Edwards has not been able to follow through on a campaign pledge to increase the minimum wage in Louisiana. “I don’t think it’s any secret that I ran on, believe in, and have on multiple occasions asked the Legislature to increase the minimum wage in Louisiana. That has not happened. I think that is a travesty,” Edwards explained. Louisiana is one of five states in the nation that doesn’t have a minimum wage law of its own. Instead, it adopts the federal minimum wage rate, which has been $7.25 an hour since 2009. Edwards supports setting the state minimum wage at $8.50 over a couple of years, and plans to put forth that legislation in the 2019 session, beginning in April. The Governor also intends to once again introduce a bill that would address the gender pay gap in Louisiana, which ranks the highest in the nation. Women in Louisiana are paid, on average, about 66 cents on the dollar, compared to their male counterparts. That pay gap is even worse for women of color, who receive 50 cents on the dollar.